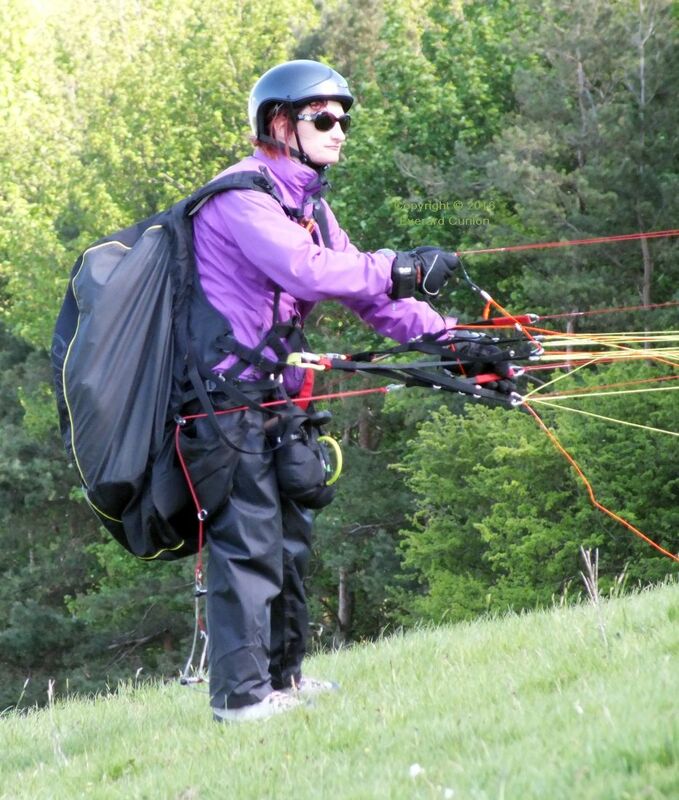 This page continues from Hang gliding 2015 part 3. Cold and blustery conditions prevailed at Monk’s Down, near Shaftsbury in north Dorset, England, on a Saturday in late April, 2016. The clouds looked good, but the lift was broken and weak. 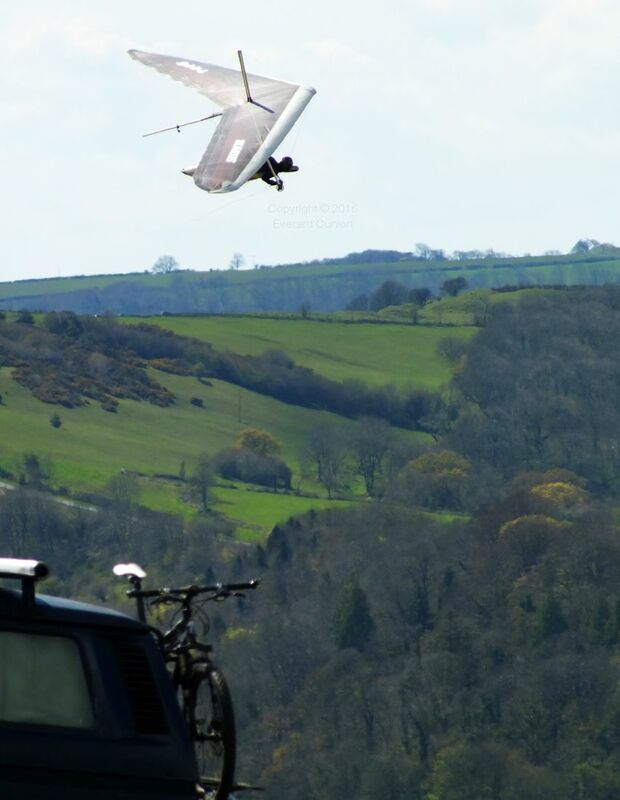 One pilot suggested setting it down in the line of trees along the top as preferable to the mud of the landing fields! I was plenty high enough to land at the top in the far corner for the first time ever. 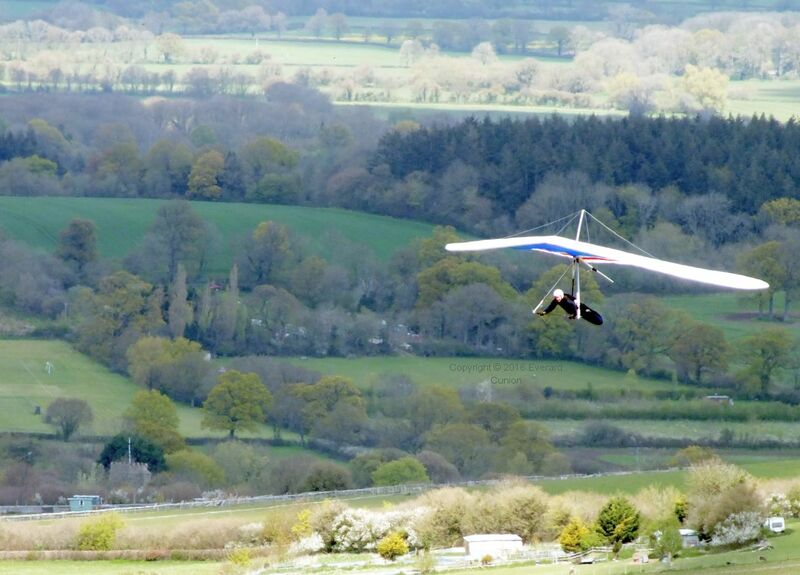 In the photo, you might be able to make out Richard M’s glider and vehicle in the corner of the top landing field at the discontinuity in the tree line. In this photo, I am undoing my harness zip, which accounts for the position of my left hand. A thermic late April day at Bell Hill, near Blandford Forum (that’s a town, not a web site) in Dorset, England, provided alternating lift and sink typical of the time of year. The U-2 was tipped sideways on final to a field close to the base of the hill and landed in a hollow bounded by a minor spur, a fifty-foot high quarried chalk face, trees, and a country road with its own hedges and trees. In the middle is an iron trough for cattle. It looked impossible. The damage was just one broken downtube! It was a familiar story on a Saturday in mid-May at Monk’s Down. 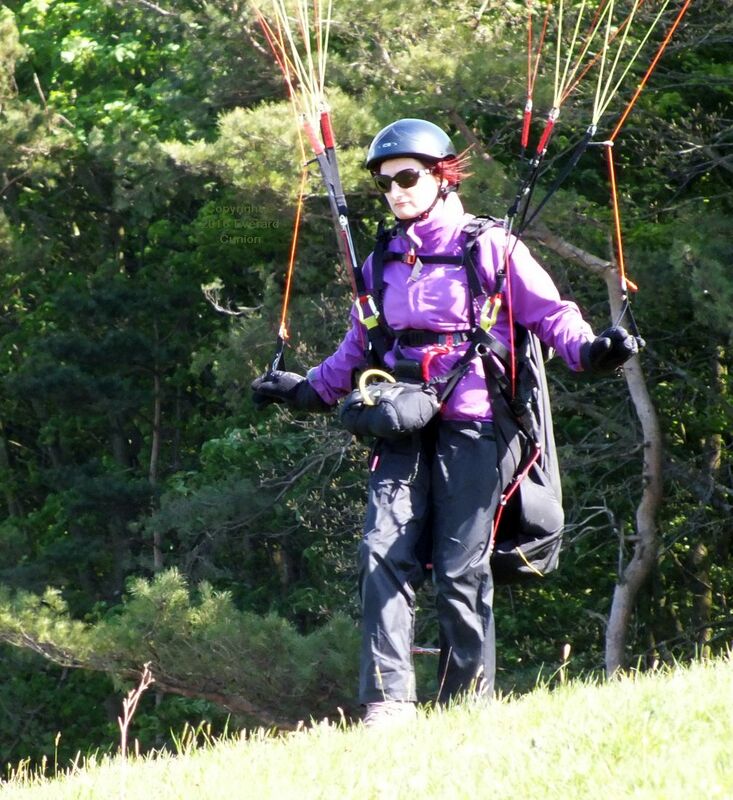 Some paragliders climbed out in thermals while the hang gliders did not do so well. Paraglider pilots begin their launch facing backwards. No kidding. When the wing is overhead (it just hangs there, supported by the lightest breeze) the pilot turns 180 degrees to face into wind and down-slope. Two steps and she is airborne! 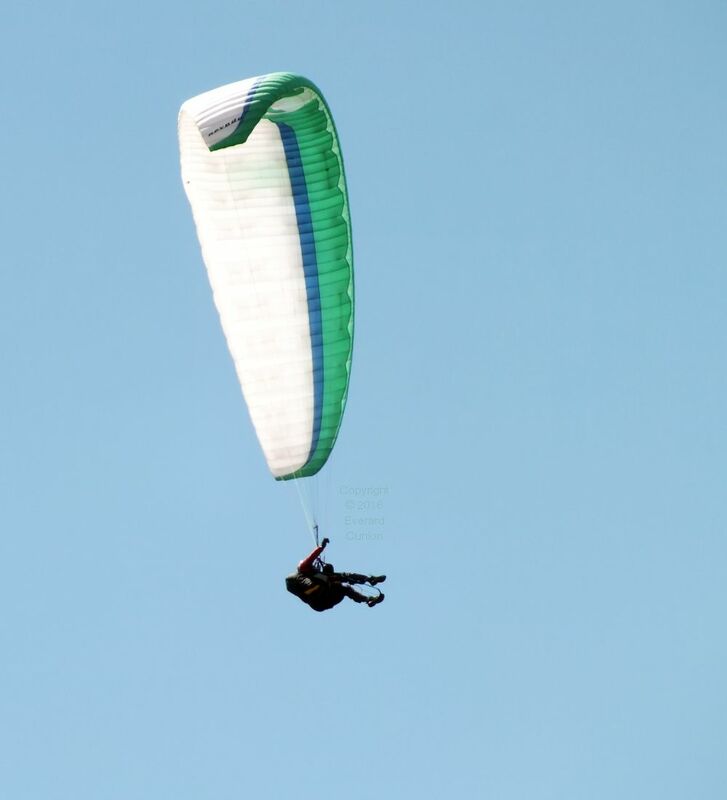 No doubt about it, paragliding is what hang gliding used to be — free flight with minimal hassle — but hang gliding is now a specialised activity suited mainly to stronger winds and ‘big air’ (strong lift and its associated turbulence). This Wills Wing 175 Sport 2 has a red streamer attached to the king-post to alert other pilots that its pilot is newly trained. He made a good flight from the top to the bottom (same as me). 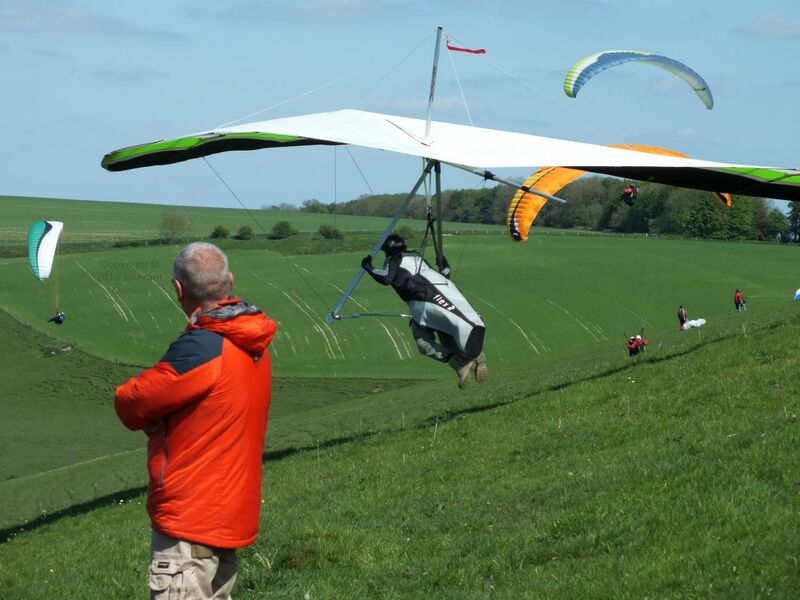 As the chief of a large hang glider manufacturer stated recently, we can make gliders more easily than we can make pilots. This was a day of light wind and thermic activity, which occasionally pulled the wind round across the slope one way or the other. When a thermal takes off from the ground, it pulls in surrounding air to prevent the proverbial vacuum that nature abhors, thus altering the surrounding wind direction. This, then, was the occasion of the pilot’s first cross-wind launch. 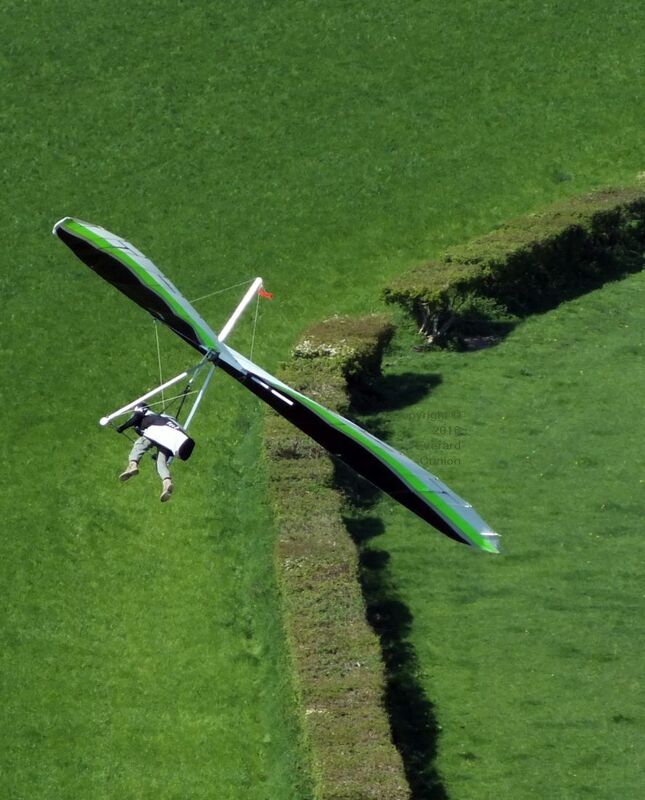 Just as in any launch, you pick up the glider and hold it level by pointing it into wind, which in a cross-wind launch is at a sideways angle to the hill rather than straight out from the slope. When you start your launch run (this is in a light wind) you move straight down the slope. 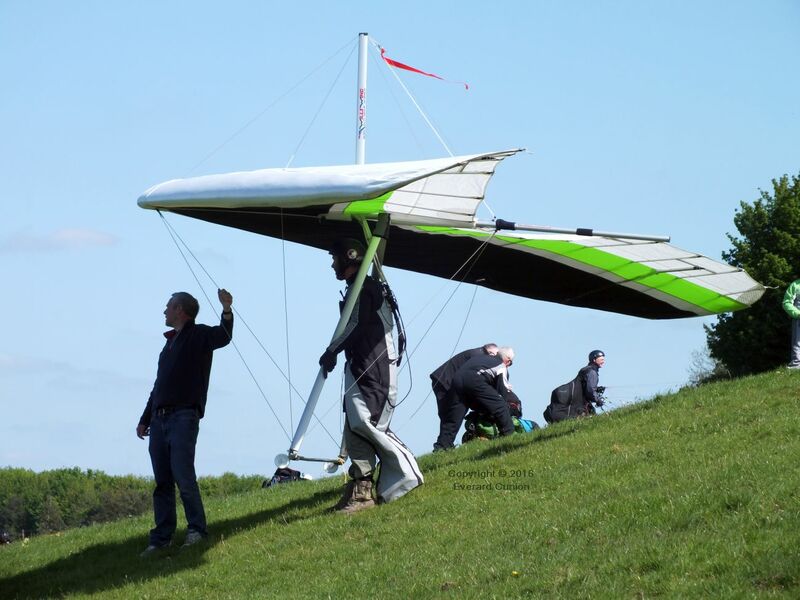 Therefore, it differs from a normal launch in that your initial direction of motion is different from the direction in which the glider is pointing. As you accelerate, the wing yaws to align more with your launch run and you lift off. (This takes about three seconds.) It feels completely natural (to the already trained pilot) when you do it. Incidentally, the wind at launch can change direction radically also in strong conditions for the same reason. See Spring thermals, an account of a crash here in 1975. The Sport 2 is similar to the U-2, but it is lighter to carry, quicker to rig, and has easier handling characteristics. However, its glide angle when flying fast is not as good. 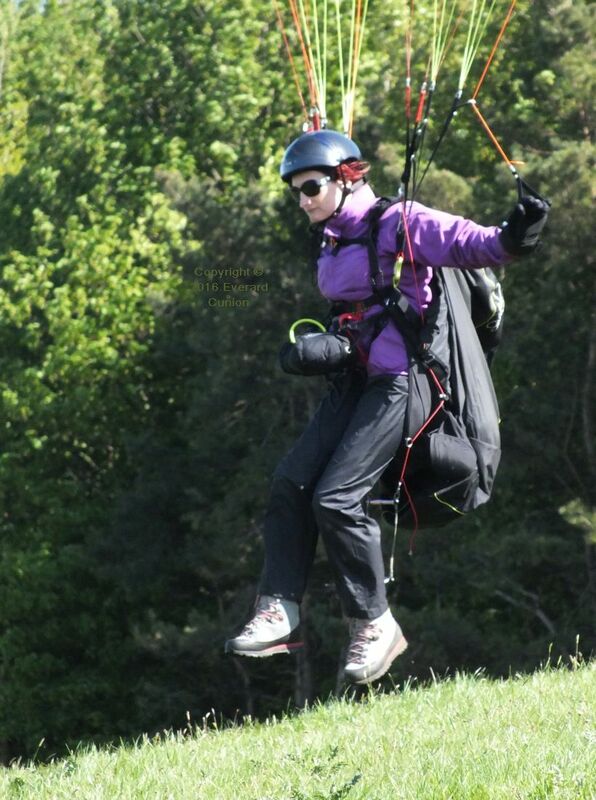 Strong wind and turbulence at Monk’s down on a Sunday in late May made for an exciting ride. I managed only one 360 degree turn in lift before heading out to land. I had plenty of speed on final, so when I found I was landing in a lull, flaring and running brought me to a halt in a few steps. Another U-2 pilot was not so lucky. 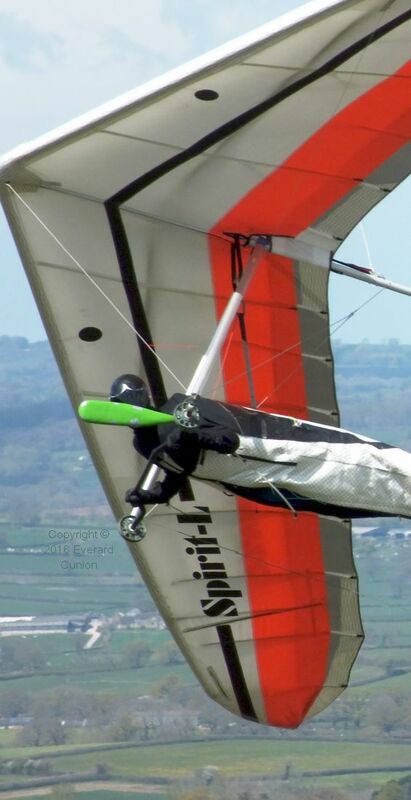 He broke two downtubes and then had his glider turned upside-down by the wind (with him in it). One of his fibreglass tip wands was damaged too. When I returned to the top, the wind was still strong, but the air was clearer and some wispy small cumulus clouds appeared, although most dissipated quickly. 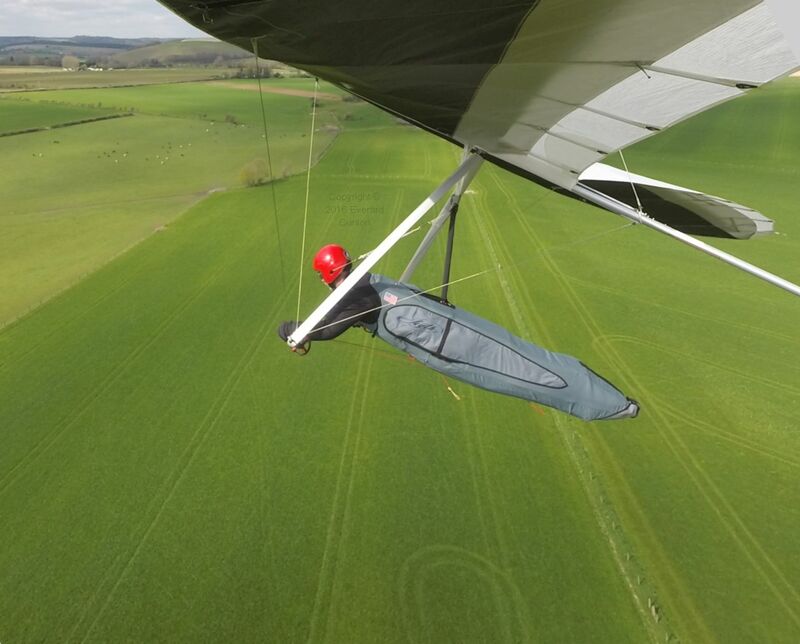 Tony P soared his Airborne 154 Sting 3 (my previous wing) without trouble. I rigged up again and, in late afternoon, I launched into an up cycle (instead of a down cycle). I climbed in a succession of 360s, levelling out up-wind between each. I did not get very high though.